Are you an employee of Malala Fund? Malala Fund is working for a world where all girls can learn and lead without fear. 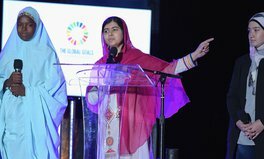 Malala Fund advocates for resources and policy change needed to give all girls a secondary education, invests in developing country educators and activists and amplifies the voices of girls fighting for change. Learn more at malala.org. We work with partners all over the world helping to empower girls and amplify their voices; we invest in local education leaders and programmes; and we advocate for more resources for education and safe schools for every child.